You probably already know that Smart & Final is a great place to shop for quality groceries at great prices. But did you know that the company’s management and employees care very much about the children and families in the communities they serve? 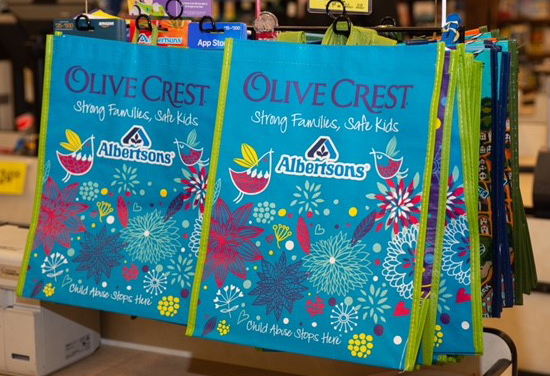 Case in point, this summer they presented a $400,000 check to Olive Crest from their most recent in-store mobile campaign! This fantastic donation will greatly impact the children and families of Olive Crest. We can’t thank Smart & Final enough for their passion and contribution to the ongoing fight against child abuse. Let’s Hear It for the Ambassador for the Children Award Winners! 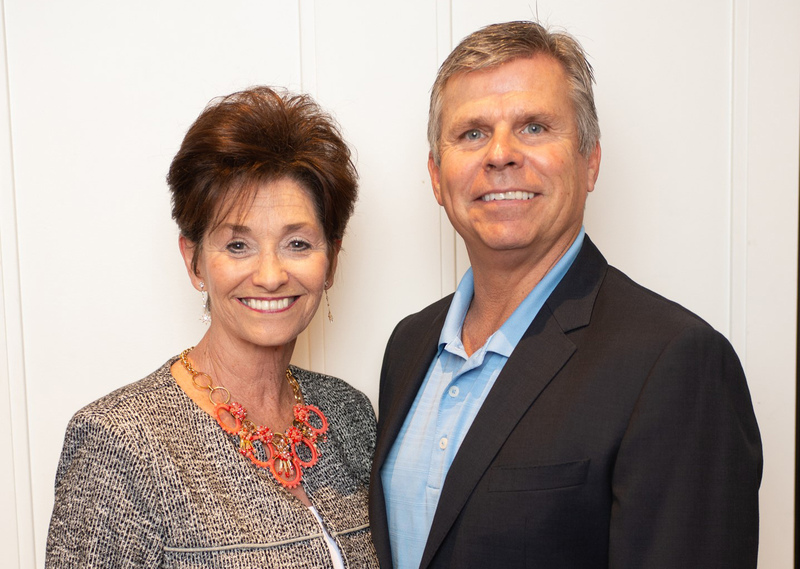 Mickie Sharp-Villanueva and Dave Grosse from The Performance Group have been selected as the 2018 Ambassador for the Children award recipients. 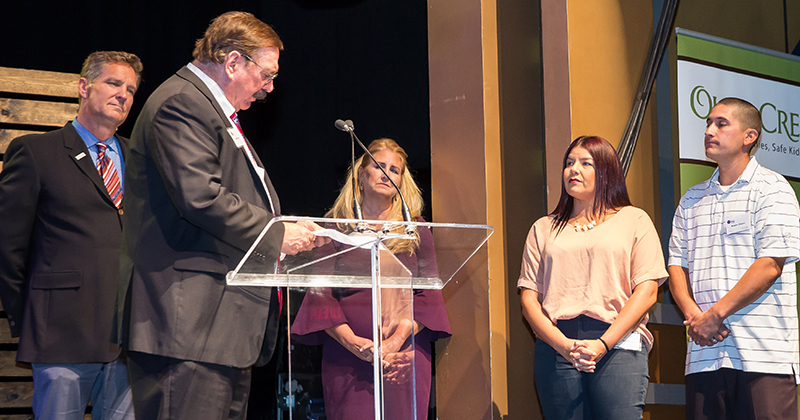 These outstanding individuals were honored at our recent An Education for Every Child luncheon, where they were praised for their “strong servant leadership and selfless dedication to Olive Crest and the families that are supported.” Their personal investments and service for over 20 years has greatly impacted the children and families we serve. Thank you, Dave and Mickie! What a blessing you are! “By the time I was 14, I was an everyday addict. When my mother didn’t have her drugs, she was angry and abusive. She’d beat me, physically. We were squatting, dirty, and homeless.” Tiffany attempted to end her life with an overdose — but she survived, and her addiction became even worse. That’s when she met the abusive man who became the father of her two children. They lived in abandoned buildings with no running water or electricity. Tiffany was in and out of jail. In fact, when she gave birth to her daughter, she was handcuffed to a hospital bed with a corrections officer counting between contractions. She wanted to get her life straightened out. But almost as soon as she was released from jail, she was back to her old habits with her children in tow: Charlie, 2, and her baby girl, Brianna. She knew she had to change…for the sake of her little ones. She called her grandmother, who explained there were two places she could get the help she needed. The first was a rescue mission that had a year-long program to help people break free from addictions. The second was Olive Crest. Tiffany’s Olive Crest team developed a plan to reunite her with her children. When she met with the family hosting her kids, she could tell immediately that they were on her side. Tiffany also watched how Leslie, her host mom, showed love and compassion to her children. “And I started to learn how to be a mother to my own kids. They took me to church with them. Tiffany says, “In Olive Crest’s Safe Families program, I didn’t just find a safe house for my kids. I found a family. I found the beginning of a new life. I’m thankful every day that my kids are healthy and doing well — that Olive Crest helped break the cycle of abuse. I have sole custody. I live in a three-bedroom apartment. I work a full-time job and am slowly working on a degree in accounting.” She has been clean and sober for five years. 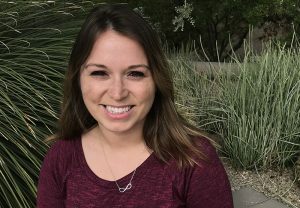 Tiffany hopes to someday use her own experience to help other young women caught up in addiction and abuse. “Without Olive Crest — and the people like you who sacrifice to support their work — my story would have turned out very differently. It’s a Celebration of Forever Families! At Olive Crest, we believe every child needs a strong family, and adoption is just one of the ways caring people can provide that for abused and neglected children. With that said, we’re thrilled to announce that a 4-year-old boy named Xavier has become the 2,500th child to find a forever family through Olive Crest. His new parents, Ruben and Melinda, first heard about Olive Crest through their church. They already had one son, Lorenzo, and knew they had more love to give. Initially, they planned to provide temporary care for children who would eventually be reunited with their biological parents. Then they heard about Xavier, who was waiting for a foster or adoptive home. 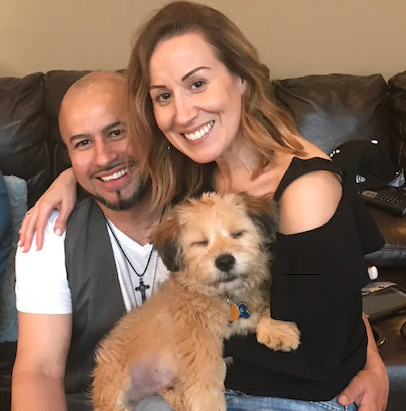 After meeting Xavier, Ruben and Melinda decided to become his foster parents and then quickly felt called to adopt him. Less than a year later, they stood in a Southern California courtroom, surrounded by family, friends, and Olive Crest staff, as Xavier became their son! Thank you for all you’ve done to make it possible for Olive Crest to help 2,500 children like Xavier find loving forever families. What a blessing you are! When you meet Michael Weitzman for the first time, it’s hard to believe he has endured so much pain and sorrow in his 21 years. His positive outlook, quick smile, and friendly demeanor could suggest images of a teen who was loved and given every opportunity to succeed. Could this be the same person who, for most of his childhood, never had a true permanent home, and thought he would never find a place where he belonged? How did he get to where he is today? When Michael was born, his mom was 18, alone, and struggling with drug and alcohol abuse. Immediately after Michael’s birth, she became pregnant with another son, Demetrius. Tragically, Demetrius died at the age of 3 months from sudden infant death syndrome. Michael says, “After my brother passed away, the police came to our home and found me all alone — sitting on the floor with a knife in my hand.” He was only about 2 years old. Thus began Michael’s journey of years of instability and multiple temporary homes. It seemed that things might change when Michael went to live with his grandfather. Instead, he endured over two years of physical and sexual abuse before Social Services removed him. A New Life. A Found Purpose. By God’s grace and with your support, Olive Crest got involved in Michael’s life. He spent the next two-plus years in the safety and care of an Olive Crest residential home for teenagers, where he found what he desperately needed. Consistency. A nurturing environment. Unconditional love. Unwavering support. With Olive Crest’s help, he graduated from high school and landed his first two jobs. Michael smiled, saying, “He told me that his dad owned a business in Tulsa, and he could set me up with a job and a place to live.” With Olive Crest’s continued support, Michael moved to Tulsa. That was nearly three years ago. “And since I moved here, everything has been getting better and better.” After a year and a half working for his mentor’s family business, Michael started Weitzman Collective — a branding, design, and digital marketing firm that helps businesses develop logos, design websites, and engage with social media audiences. 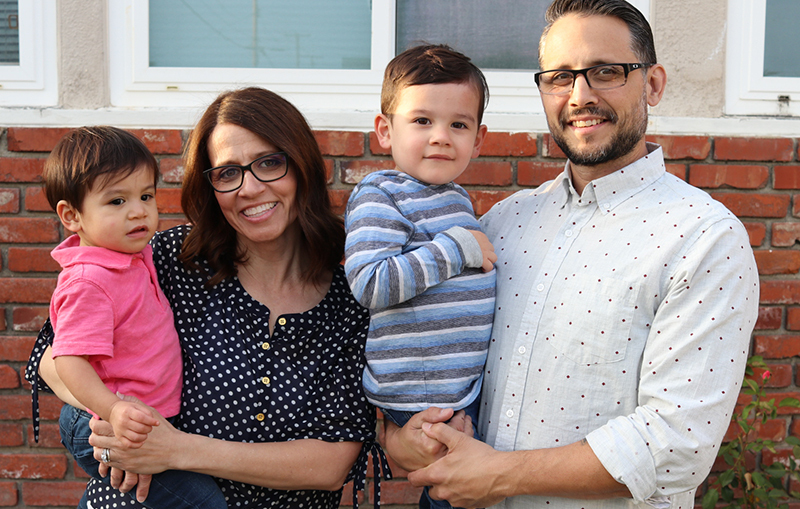 His spirit and purpose renewed, Michael spent six months as a missionary in Quito, Ecuador, and now serves as one of the teaching pastors of his church, called The Church That Matters, in Sand Springs, Oklahoma. He frequently shares his story at other churches in the Tulsa area and at events hosted by organizations that work with children. Like most 4-year-old children, Paxtyn is full of life and energy. She loves to sing and dance, and her face lights up if she can make her 2-year-old sister, Eleanor, laugh. She also has a great time getting into mischief with her little brother, Etsen, who is 3 years old. But that wasn’t always the case for this precious child. In the first 21 months of her life, she endured the pain of 15 fractured ribs and a broken clavicle — allegedly at the hands of her mother’s boyfriend. What makes this tragic story even more heartbreaking is that she was never seen by a doctor or treated for any of these injuries. Instead, she was put back in her crib and left to cry herself to sleep. It was only when she was taken to the doctor for an unrelated condition that all of the broken bones and other injuries were discovered. An investigation came to the conclusion that the injuries were intentionally inflicted and that Paxtyn must be placed in care for protection. That’s when Olive Crest became involved in Paxtyn’s life, and contacted Kendra and Ben, a young couple who had just completed their training to be Olive Crest parents. Their plans were complicated when Kendra became pregnant with Etsen just as they finished their foster training. She says that when Paxtyn came to live with them, they fell in love with her right away. Although she was too young to remember what happened to her, the pain she had endured made itself known in other ways. She had night terrors and would wake up screaming and crying in the middle of the night at least five times a week. She also suffered from severe separation anxiety. Paxtyn didn’t want to let her adoptive parents out of her sight. “It was only over time that we realized how deeply she was impacted,” Kendra says. Kendra says that Paxtyn is still overcoming a few issues. “She has some anxiety. But she’s more trusting of us, and she’s very caring and loving. She has come a long way,” she says. Thank You for Helping Olive Crest Build Happy Families! Happy. Energetic. Outgoing. These are some of the words that come to mind when you first meet Tristan and Eli Struwe. They are bright-eyed boys who love each other, their parents, and fun outings like trips to Disneyland. And it’s obvious that they are the light in the eyes of their parents, Kelly and Bryan. But life would be much different for these two little guys — and their parents, too — if not for caring friends like you who support the work of Olive Crest. Both boys were born to women who couldn’t care for them. They had no families to love them or help them fulfill their potential. Shortly after Kelly and Bryan decided to adopt through Olive Crest, the call came. An 8-month-old boy was in urgent need of a loving family. And amazingly, the child was a full-blooded Choctaw Indian, the same as Bryan! Kelly had chills, feeling blessed by the gift of this child. When Tristan came into the family in February of 2015, he was uncertain and withdrawn. But with the warmth and care of his new parents’ love, his personality quickly began to develop and blossom. As for Kelly and Bryan, they felt a joy and peace they had never experienced before. healthy baby boy named Eli. Kelly cried as once again, she felt that God was giving her the desires of her heart. At Olive Crest, we work hard to ensure that children who need forever families are matched with the right parents. motion. The Bible says, “God sets the lonely in families. . .” (Psalm 68:6), and sometimes, He does that through generous, caring hearts like yours. Roshaunda is bright, beautiful, caring, poised, articulate, and confident. She clearly has a lot going for her. Just weeks away from obtaining her Bachelor’s degree in Childhood Development, Roshaunda plans to pursue a Master’s degree in Social Work. Ultimately, she hopes to make a career out of helping children through Olive Crest. Roshaunda is also a recovering victim of abuse and a survivor of a horrific childhood. When she was a little girl, she and her siblings were removed from their mother, as she often left them alone for days while she fed her gambling addiction. Tragically, during that time, neighbors noticed the children were home alone, and one of them took advantage of and sexually assaulted Roshaunda’s oldest sister. From that time on, Roshaunda was in and out of various homes, some good and others not-so-good. One, in particular was terrible. “One time they spanked us with a belt, and I guess they didn’t think that was good enough so they began beating us with an extension cord. I was in my room crying when I saw them beating my brother, who was only six. I couldn’t stand it, and I went crazy.” Somehow, she escaped from the house, ran down the street, and managed to call the police. That day, Roshaunda and her brother were moved to a new home. surrounded by the care and nurturing she had needed for so many years. At Olive Crest, she also learned how to manage a household budget and pay rent. “But it isn’t really rent, because at the end of your time there, they give it all back to you. Not only that, but they also match all the money you’ve saved.” Roshaunda set a record and received an award for saving $9,000, which she used to help pay for her college education. those she met at Olive Crest will be her lifelong friends. restore the lives of young people like Roshaunda. We will keep you updated as she keeps pursuing her dreams!